Rainbow Six Siege was our favorite game of E3 last year. 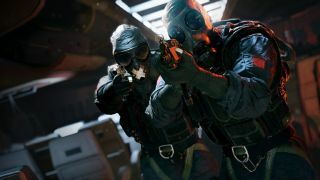 After the cancellation of Rainbow Six Patriots, we couldn't have been more impressed with Ubisoft's focused, multiplayer-centric approach to rebooting its now seven-year-dormant tactical FPS. Short rounds, a five-on-five format, no respawning, and a high-fidelity destruction system are a pretty good recipe for distinguishing yourself from Battlefield and Call of Duty. Ubisoft invited me and other press to play Siege a second time at its studio in Montreal where the game is being made, and I've captured my impressions so far in the gameplay video above.